"Cro-Magnon" redirects here. For the site of the first discovered Cro-Magnons, see Cro-Magnon rock shelter. For other uses, see Cro-Magnon (disambiguation). European early modern humans (EEMH) in the context of the Upper Paleolithic in Europe refers to the early presence of anatomically modern humans in Europe. The term "early modern" is usually taken to include fossils of the Bohunician, Ahmarian, Aurignacian, Gravettian, Solutrean and Magdalenian, extending throughout the Last Glacial Maximum (LGM), covering the period of roughly 48,000 to 15,000 years ago, usually referred to as the Cro-Magnon. The earliest sites in Europe dated 48,000 years ago are Riparo Mochi (Italy), Geissenklösterle (Germany), and Isturitz (France). The upper limit of 15,000 marks the transition to the European Mesolithic, depending on the region also given in the range of 12,000 to 10,000 years ago. Use of "Cro-Magnon" is mostly to times after the beginning of the Aurignacian proper, c. 37 to 35 ka. Genetically, EEMH form an isolated population between 37 and 14 ka, with significant Mesolithic admixture from the Near East and Caucasus beginning around 14 ka. The description as "modern" is used as contrasting with the "archaic" Neanderthals who lived within Europe from 400,000 to 37,000 years ago. The term EEMH is equivalent to Cro-Magnon Man, or Cro-Magnons, a term derived from the Cro-Magnon rock shelter in southwestern France, where the first EEMH were found in 1868. Louis Lartet (1869) proposed Homo sapiens fossilis as the systematic name for "Cro-Magnon Man". W.K. Gregory (1921) proposed the subspecies name Homo sapiens cro-magnonensis. In literature published since the late 1990s, the term EEMH is generally preferred over the common name Cro-Magnon, which has no formal taxonomic status, as it refers neither to a species or subspecies nor to an archaeological phase or culture. Another known remains of EEMH can be dated to before 40,000 years ago (40 ka) with some certainty: those from Grotta del Cavallo in Italy, and from Kents Cavern in England, have been radiocarbon dated to 45–41 ka. A number of other early fossils are dated close to or just after 40ka, including fossils found in Romania (Peștera cu Oase, 42–37 ka) and Russia (Kostenki-14, 40–35 ka). The Siberian Ust'-Ishim man, dated to 45 ka, was not geographically found in Europe, and indeed is not part of the "Western Eurasian" genetic lineage, but intermediate between the Western Eurasian and East Asian lineages. The EEMH lineage in the European Mesolithic is also known as "West European Hunter-Gatherer" (WHG). These mesolithic hunter-gatherers emerge after the end of the LGM ca. 15 ka and are described as more gracile than the Upper Paleolithic Cro-Magnons. The WHG lineage survives in contemporary Europeans, albeit only as a minor contribution overwhelmed by the later Neolithic and Bronze Age migrations. Map of the distribution of the main pre-LGM Aurignacian sites. Map of Magdalenian sites at the transition between the Upper Paleolithic and the Mesolithic. While anatomically modern humans (AMH) may have been present in West Asia since before 250 ka, modern non-Africans mainly descend from the main successful out of Africa expansion at around 65 ka. This movement was an offshoot of the rapid expansion within East Africa associated with mtDNA haplogroup L3. EEMH are associated with mtDNA haplogroup N, also widespread in Central Asia, and with Y-chromosomal haplogroup IJK. AMH are estimated to have interbred with Neanderthals during about 65 to 47 ka, most likely in West Asia. It is this basal West Eurasian lineage that began to move into Europe beginning about 45 ka. Neanderthals became extinct shortly after this time, presumably being outcompeted or actively killed by the advancing EEMH. Admixture with Neanderthals appears to cease almost entirely after 45 ka, in spite of several millennia of continued co-existence of AMH and Neanderthals in Europe. There are two main hypotheses as to the route taken by the earliest AMH entering Europe, following the Danubian corridor or the Mediterranean coast along the Balkans. Support for either hypothesis relies on accurate dating of the earliest known fossils in the region. High-precision dating of the earliest Proto-Aurignacian sites in Europe, Riparo Mochi (Italy), Geissenklösterle (Germany), and Isturitz (France), have yielded dates of close to 42 ka, indicating that EEMH spread throughout Western Europe very rapidly. EEMH sites in Europe earlier than 37 ka are also termed Proto-Aurignacian. The Aurignacian proper, the stage associated with the original Cro-Magnon find, appears to have developed within Europe. It lasts from 37 ka until about 28 ka. The Gravettian is the European culture immediately preceding the LGM, about 28 to 22 ka, but the early Gravettian overlaps with the later Aurignacian, from as early as 33 ka. During the LGM proper, beginning about 22 ka, there are two main refugia, the Solutrean in Southwestern Europe, and the Epi-Gravettian in Italy and Southeastern Europe. With advancing deglaciation, after about 17 ka, finds associated with the Magdalenian, are transitional to the mesolithic hunter-gatherer (WHG) populations. The European Mesolithic is taken to begin after about 14 ka (Azilian). Cro-Magnons were anatomically modern, straight limbed and tall compared to the contemporaneous Neanderthals. They are thought to have stood on average 1.66 to 1.71 m (5 ft 5 in to 5 ft 7 in) tall. They differ from modern-day humans in having a more robust physique and a slightly larger cranial capacity. The Cro-Magnons had fairly low skulls, with wide faces, robust mandibles, blunted chins, narrow noses, and moderate to no prognathism. A distinctive trait was the rectangular eye orbits, similar to those of modern Ainu people. Their vocal apparatus was like that of present-day humans and they could speak. Their brain capacity was about 1,600 cc (98 cu in), which is larger than the average for modern Europeans. Mitochondrial DNA analysis places the early European population as sister group to the East Asian groups of the Upper Paleolithic, dating the divergence to some 50,000 years ago. Analysis of ancient DNA of EEMH and Mesolithic fossils suggests that alleles related to the light skin characteristic of modern Europeans (TYRP1 SLC24A5 and SLC45A2) were not yet present. They are thought to have arisen during the LGM, most likely in the Caucasus, and were spread to Europe in a "selective sweep" during the late Upper Paleolithic to early Mesolithic, between c. 19 to 11 ka. The HERC2 variation for blue eyes first appears around 14 ka in Italy and the Caucasus. The flint tools found in association with the remains at Cro-Magnon have associations with the Aurignacian culture that Lartet had identified a few years before he found the first skeletons. The Aurignacian differ from the earlier cultures by their finely worked bone or antler points and flint points made for hafting, the production of Venus figurines and cave painting. They pierced bones, shells and teeth to make body ornaments. The figurines, cave-paintings, ornaments and the mysterious Venus figurines are a hallmark of Cro-Magnon culture, contrasting with the utilitarian culture of the Neanderthals. Like most early humans, the Cro-Magnons were primarily big-game hunters, killing mammoth, cave bears, horses, and reindeer. They hunted with spears, javelins, and spear-throwers. Archery had not yet been invented. They would have been nomadic or semi-nomadic, following the annual migration of their prey, and would also have eaten plant materials. In Mezhirich village in Ukraine, several huts built from mammoth bones possibly representing semi-permanent hunting camps have been unearthed. Finds of spun, dyed, and knotted flax fibers among Cro-Magnon artifacts in Dzudzuana shows they made cords for hafting stone tools, weaving baskets, or sewing garments. Apart from the mammoth bone huts mentioned, they constructed shelters of rocks, clay, branches, and animal hide/fur. Manganese and iron oxides were used in rock paintings. Grotta del Cavallo Italy Proto-Aurignacian 44 In November 2011, tests conducted at the Oxford Radiocarbon Accelerator Unit in England on what were previously thought to be Neanderthal baby teeth, which had been unearthed in 1964 from the Grotta del Cavallo in Italy. These were identified as the oldest anatomically modern remains ever discovered in Europe, dating from between 43,000 and 45,000 years ago. No tools were associated with the find. Geissenklösterle Central Europe (Germany) Proto-Aurignacian 42 The bone flute of Geissenklösterle (Swabia) has been radiocarbon dated to 43–42 ka. The so-called adorant from the Geißenklösterle cave is somewhat younger (40–35 ka). 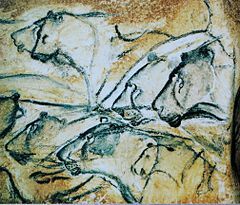 Other paleolithic art of the early Aurignacian was found in the Swabian Alb area, including Venus of Hohle Fels and the Lion-man figurine (see Caves and Ice Age Art in the Swabian Jura) No dated human remains are associated with these finds. Kostenki-14 Eastern Europe (Russia) Proto-Aurignacian 38 A male from Kostenki-14 (Markina Gora), dated 35–40 ka, was found to have a close relationship to both "Mal'ta boy" (24 ka) of central Siberia (Ancient North Eurasian) and to the later Mesolithic hunter-gatherers of Europe and western Siberia, as well as with a basal population ancestral to Early European Farmers. Peștera cu Oase ("Bones Cave") near the Iron Gates in Romania appears to be a cave bear den; the human remains may have been prey or carrion. No tools are associated with the finds. Oase 1 holotype is a robust mandible which combines a variety of archaic, derived early modern, and possibly Neanderthal features. The modern attributes place it close to EEMH among Late Pleistocene samples. The fossil is one of the few finds in Europe which could be directly dated and is at least 37,800 years old. Oase 2 (and fragments Oase 3), discovered in 2005, is the skull of a young male, again with mosaic features, some of which are paralleled in the Oase 1 mandible. Kent's Cavern Western Europe (UK) Proto-Aurignacian 36 The Kent's Cavern find is a prehistoric maxilla (upper jawbone) fragment was uncovered in the cavern during a 1927 excavation in Kents Cavern by the Torquay Natural History Society, and named Kent's Cavern 4. In 1989 the fossil was radiocarbon dated to be from 36,400–34,700 years ago, although various fauna fossils in older strata present on the site have been dated in 2011 to 44,200–41,500 years ago and indirectly associated with the human remains, the latest datings and conclusions in question being highly disputed . Kostenki-12 Eastern Europe (Russia) Aurignacian 33 Dated at 32,600 ± 1,100 radio-carbon years, the find from Kostenki consists of a tibia and a fibula in a rich culture layer. The occupation layers contain bone and ivory artifacts, including possible figurative art, and fossil shells imported more than 500 kilometers. Gower Western Europe (UK) Aurignacian 33 Despite its name, the Red Lady of Paviland is a partial skeleton of a young male, lacking a skull. It was discovered in 1823 in a cave burial in Gower, South Wales, United Kingdom. The bones were stained with ochre, and it was the first human fossil to have been found anywhere in the world. At 33,000 years old, it is still the oldest ceremonial burial of a modern human ever discovered anywhere in Western Europe. Associated finds were red ochre anointing, a mammoth skull, and personal decorations suggesting shamanism or other religious practice. Grave goods are considered late Aurignacian or Early Gravettian in appearance. Genetic analysis of mtDNA yielded the Haplogroup H, the most common group in Europe. La Quina Aval Western Europe (France) Aurignacian 33 Consisting of a partial juvenile mandible, the find is also associated with early Aurignacian tools. The jaw has some archaic features, though it is mainly modern. The find is dated to max 33,000–32,000 radiocarbon years. Les Roisà Mouthiers Western Europe (France) Aurignacian 32 There are diagnostic modern human remains associated with a later Aurignacian assemblage at Les Roisà Mouthiers, France. The date is likely not older than 32,000 radiocarbon years. Mladeč caves Central Europe (Czech Republic) Aurignacian 31 The Mladeč caves in Moravia have yielded the remains of several individuals, but few artifacts. The artifacts found have tentatively been classified as Aurignacian. The finds have been radiocarbon dated to around 31,000 radiocarbon years (somewhat older in calendar years), Mladeč 2 is dated to 31,320 +410, -390, Mladeč 9a to 31,500 +420, -400 and Mladeč 8 to 30,680 +380, -360 14C years. The Peștera Muierilor ("Women's Cave") find is a single, fairly complete cranium of a woman with rugged facial traits and otherwise modern skull features, found in a lower gallery of the cave, among numerous cave bear remains. Radiocarbon dating yielded an age of 30,150 ± 800 years. No associated tools were found. Muierii and Cioclovina Caves Southeastern Europe (Romania) Aurignacian 30 Cioclovina 1 is a complete neurocranium from a robust individual lacking all facial bones. The find is from a cave bear den, Cioclovina Cave, Romania. It is dated at 29,000 ± 700 radiocarbon years. The original Cro-Magnon find was discovered in a rock shelter at Les Eyzies, Dordogne, France. The type specimen from the site is Cro-Magnon 1, a male, carbon dated to about 28,000 14C years old. (27,680 ± 270 BP). Compared to Neanderthals, the skeletons showed the same high forehead, upright posture and slender (gracile) skeleton as modern humans. The other specimens from the site are a female, Cro-Magnon 2, and another male, Cro-Magnon 3. The condition and placement of the remains of Cro-Magnon 1, along with pieces of shell and animal teeth in what appear to have been pendants or necklaces, raises the question of whether they were buried intentionally. If Cro-Magnons buried their dead intentionally, it suggests they had a knowledge of ritual, by burying their dead with necklaces and tools, or an idea of disease and that the bodies needed to be contained. Analysis of the pathology of the skeletons shows that the humans of this period led a physically difficult life. In addition to infection, several of the individuals found at the shelter had fused vertebrae in their necks, indicating traumatic injury; the adult female found at the shelter had survived for some time with a skull fracture. As these injuries would be life-threatening even today, this suggests that Cro-Magnons relied on community support and took care of each other's injuries. The Abri of Cro-Magnon is part of the UNESCO World Heritage of the "Prehistoric Sites and Decorated Caves of the Vézère Valley". Předmostí Central Europe (Czech Republic) Aurignacian-Gravettian 26 The Předmostí site, near Přerov, Moravia was discovered in the late 19th century. Excavations were conducted between 1884 and 1930. As the original material was lost during World War II, in the 1990s, new excavations were conducted. The Předmostí site appears to have been a living area with associated burial ground with some 20 burials, including 15 complete human interments, and portions of five others, representing either disturbed or secondary burials. Cannibalism has been suggested to explain the apparent subsequent disturbance, though it is not widely accepted. The non-human fossils are mostly mammoth. Many of the bones are heavily charred, indicating they were cooked. Other remains include fox, reindeer, ice-age horse, wolf, bear, wolverine, and hare. Remains of three dogs were also found, one of which had a mammoth bone in its mouth. The Předmostí site is dated to between 24,000 and 27,000 years old. The people were essentially similar to the French Cro-Magnon finds. Though undoubtedly modern, they had robust features indicative of a big-game hunter lifestyle. They also share square eye socket openings found in the French material. Balzi Rossi Italy Aurignacian-Gravettian 25 Grimaldi Man is a find from the Ligurian Coast in Italy. The caves yielded several finds, among them two fairly complete skeletons in the lower Aurignacian layer. Though the age and accompanying tools suggests Cro-Magnon, the skeletons differ physically from the large and robust Cro-Magnons, being slender and rather short. The remains from one of the caves, the "Barma Grande", have in recent time been radiocarbon dated to 25 ka. The Venus figurines of Balzi Rossi have been dated to the later Gravettian or Epi-Gravettian, 24 to 19 ka. Abrigo do Lagar Velho Western Europe (Portugal) Gravettian 24 The Lapedo child from Abrigo do Lagar Velho, Portugal, about 24,000 years old, a fairly complete and quite robust skeleton, possibly showing some Neanderthal traits. The Abri Pataud shelter shows human habitation throughout the Aurignacian to Solutrean, but was abandoned in the early Magdalenian, about 17 ka. The "Pataud woman" is the name given to the remains of a young woman, about 20 years old, deposited with the body of a newborn child, and is about 21,000 years old. The woman's skull was buried separately, about four meters from the body, lying protected between stones. Chancelade man, a short and stocky older man buried in Chancelade, France, was found with Magdalenian tools. Several other more fragmentary finds, like the skeleton from Laugerie-Basse and the Duruthy cave near Sorde-l'Abbaye has traditionally been linked to the Chancelade man. The morphological difference in the Chancelade skull compared to the "stockier" Cro-Magnon type has been taken as evidence for a Gravettian or Magdalenian-era influx of a different population unrelated to the Aurignacian EEMH. Cap Blanc rock shelter Western Europe (France) Magdalenian-Azilian 14 Magdalenian Girl is a female skeleton, discovered in Dordogne in 1911. Dating to the later Magdalenian, transitional to the beginning Mesolithic. Grotte du Bichon Western Europe (Switzerland) Magdalenian-Azilian 14 Bichon man is the skeleton of a young male of the mesolithic hunter-gatherer (WHG) lineage. Villabruna 1 is a skeleton, dated 14.1–13.8 ka, buried in a shallow pit, the head turned to the left with arms stretched touching the body, with grave goods typical of hunter-gatherer equipment. Villabruna 1 is the oldest bearer of Y-haplogroup R1b found in Europe, and has been taken as a representative of the beginning post-LGM (Mesolithic) migration movement from the Near East. The lineage of EEMH contributes substantially to the modern populations indigenous to Europe. EEMH populations during the Last Glacial Maximum were probably confined to refugia, associated with the Solutrean and Gravettian cultures. From there, Europe was re-peopled during the Holocene climatic optimum. The genetic contribution of these populations to modern Europeans is dubbed "West European Hunter-Gatherer" (WHG). The identification of the WHG component in modern populations is based on the analysis of the genome of a Mesolithic hunter-gatherer buried c. 8000 years ago in the Loschbour rock shelter in Müllerthal, near Heffingen, Luxembourg. According to Fu et al. (2016), the mesolithic WHG lineage (dubbed the "Villabruna Cluster") already contains post-LGM admixture from the Near East and Caucasus, ending the period of isolation in EEMH of c. 37 to 14 ka. The WHG populations mixed extensively with the expanding Early European Farmers (EEF) populations during the European Neolithic. In terms of unipaternal lineages, EEMH were descended from the patrilineal Y-DNA haplogroups Haplogroup IJ and C1, and maternal mt-DNA haplogroup N (and descendant haplogroups R and U). Y-haplogroup IJ likely arose still in Southwest Asia. haplogroup I emerged about 35 to 30 ka, either in Europe or West Asia. Y-haplogroup K2a* (K-M2308) is associated with Central Asia, found in Siberian Ust'-Ishim man, but also in the Proto-Aurignacian Oase 1 fossil (Romania). Mt-haplogroup U5 arose in Europe just prior to the LGM, between 35 and 25 ka. "Bichon man", an Azilian (early Mesolithic) skeleton found in the Swiss Jura, was found to be associated with the WGH lineage He was a bearer of Y-DNA haplogroup I2a and mtDNA haplogroup U5b1h. Wikimedia Commons has media related to European early modern humans. Wikimedia Commons has media related to Cro-Magnons. ^ a b c Fu, Qiaomei; et al. (23 October 2014). "The genome sequence of a 45,000-year-old modern human from western Siberia". Nature. 514 (7523): 445–49. Bibcode:2014Natur.514..445F. doi:10.1038/nature13810. hdl:10550/42071. PMC 4753769. PMID 25341783. ^ 42.7–41.5 ka (1σ CI). Katerina Douka et al., A new chronostratigraphic framework for the Upper Palaeolithic of Riparo Mochi (Italy), Journal of Human Evolution 62(2), 19 December 2011, 286–99, doi:10.1016/j.jhevol.2011.11.009. ^ a b Fagan, B.M. (1996). The Oxford Companion to Archaeology. Oxford: Oxford University Press. p. 864. ISBN 978-0-19-507618-9. The term "Cro-Magnon" has no formal taxonomic status, since it refers neither to a species or subspecies nor to an archaeological phase or culture. The name is not commonly encountered in modern professional literature in English, since authors prefer to talk more generally of anatomically modern humans (AMH). They thus avoid a certain ambiguity in the label "Cro-Magnon", which is sometimes used to refer to all early moderns in Europe (as opposed to the preceding Neanderthals), and sometimes to refer to a specific human group that can be distinguished from other Upper Paleolithic humans in the region. Nevertheless, the term "Cro-Magnon" is still very commonly used in popular texts because it makes an obvious distinction with the Neanderthals, and also refers directly to people rather than to the complicated succession of archaeological phases that make up the Upper Paleolithic. This evident practical value has prevented archaeologists and human paleontologists from dispensing entirely with the idea of Cro-Magnons. ^ Benazzi, S.; Douka, K.; Fornai, C.; Bauer, C.C. ; Kullmer, O.; Svoboda, J.Í. ; Pap, I.; Mallegni, F.; Bayle, P.; Coquerelle, M.; Condemi, S.; Ronchitelli, A.; Harvati, K.; Weber, G.W. (2011). "Early dispersal of modern humans in Europe and implications for Neanderthal behaviour". Nature. 479 (7374): 525–28. Bibcode:2011Natur.479..525B. doi:10.1038/nature10617. PMID 22048311. Higham, T.; Compton, T.; Stringer, C.; Jacobi, R.; Shapiro, B.; Trinkaus, E.; Chandler, B.; Gröning, F.; Collins, C.; Hillson, S.; o’Higgins, P.; Fitzgerald, C.; Fagan, M. (2011). "The earliest evidence for anatomically modern humans in northwestern Europe". Nature. 479 (7374): 521–24. Bibcode:2011Natur.479..521H. doi:10.1038/nature10484. PMID 22048314. ^ Seguin-Orlando, A.; Korneliussen, T.S. ; Sikora, M.; Malaspinas, A.-S.; Manica, A.; Moltke, I.; Albrechtsen, A.; Ko, A.; Margaryan, A.; Moiseyev, V.; Goebel, T.; Westaway, M.; Lambert, D.; Khartanovich, V.; Wall, J.D. ; Nigst, P.R. ; Foley, R.A.; Lahr, M.M. ; Nielsen, R.; Orlando, L.; Willerslev, E. (6 November 2014). "Genomic structure in Europeans dating back at least 36,200 years". Science. 346 (6213): 1113–18. Bibcode:2014Sci...346.1113S. doi:10.1126/science.aaa0114. PMID 25378462. ^ Posth, Cosimo; et al. (4 July 2017). "Deeply divergent archaic mitochondrial genome provides lower time boundary for African gene flow into Neanderthals". Nature Communications. 8: 16046. doi:10.1038/ncomms16046. ^ P. Soares et al., "The Expansion of mtDNA Haplogroup L3 within and out of Africa", Molecular Biology and Evolution, Volume 29, Issue 3, 1 March 2012, 915–27, doi:10.1093/molbev/msr245. ^ Caramelli, D; Lalueza-Fox, C; Vernesi, C; Lari, M; Casoli, A; Mallegni, F; Chiarelli, B; Dupanloup, I; Bertranpetit, J; Barbujani, G; Bertorelle, G (May 2003). "Evidence for a genetic discontinuity between Neandertals and 24,000-year-old anatomically modern Europeans". Proc. Natl. Acad. Sci. U.S.A. 100 (11): 6593–97. Bibcode:2003PNAS..100.6593C. doi:10.1073/pnas.1130343100. PMC 164492. PMID 12743370. ^ Kuhlwilm, M.; Gronau, I.; Hubisz, M.J.; de Filippo, C.; Prado-Martinez, J.; Kircher, M.; et al. (2016). "Ancient gene flow from early modern humans into Eastern Neanderthals". Nature. 530 (7591): 429–33. Bibcode: 2016Natur.530..429K. doi:10.1038/nature16544. PMC 4933530. ^ Currat, M.; Excoffier, L. (2004). "Modern Humans Did Not Admix with Neanderthals during Their Range Expansion into Europe". PLoS Biol. 2 (12): e421. doi:10.1371/journal.pbio.0020421. PMC 532389. PMID 15562317. ^ Hoffecker, J.F. (July 1, 2009). "The spread of modern humans in Europe". PNAS. 106 (38): 16040–45. Bibcode:2009PNAS..10616040H. doi:10.1073/pnas.0903446106. PMC 2752585. PMID 19571003. ^ Jacobi, R.M. ; Higham, T.F.G. ; Haesaerts, P.; Jadin, I.; Basell, L.S. (2015). "Radiocarbon chronology for the Early Gravettian of northern Europe: New AMS determinations for Maisières-Canal, Belgium". Antiquity. 84 (323): 26–40. doi:10.1017/S0003598X00099749. ^ a b "Cro-Magnon". Encyclopædia Britannica Online. Archived from the original on October 20, 2010. Retrieved October 20, 2010. ^ Osborn, Henry Fairfield (1915). Men of the Old Stone Age: Their Environment, Life and Art. New York: Charles Scribner's Sons. p. 500 – via archive.org. ^ a b Velemínskáa, J.; Brůžekb, J.; Velemínskýd, P.; Bigonia, L.; Šefčákováe, A.; Katinaf, F. (2008). "Variability of the Upper Palaeolithic skulls from Předmostí near Přerov (Czech Republic): Craniometric comparison with recent human standards". Homo. 59 (1): 1–26. doi:10.1016/j.jchb.2007.12.003. PMID 18242606. Archived from the original on 2012-12-08. ^ a b Koehl, Dan. "The Cro Magnon man (Homo sapiens sapiens) Anatomically Modern or Early Modern Humans". elephant.se. Grolier Multimedia Encyclopedia. ^ Maca-Meyer N, González AM, Larruga JM, Flores C, Cabrera VM (2001). "Major genomic mitochondrial lineages delineate early human expansions". BMC Genet. 2: 13. doi:10.1186/1471-2156-2-13. PMC 55343. PMID 11553319. ^ S. Beleza et al., "The Timing of Pigmentation Lightening in Europeans", Molecular Biology and Evolution, Volume 30, Issue 1, 1 January 2013, pp. 24–35, doi:10.1093/molbev/mss207 see also: E.R. Jones, "Upper Palaeolithic genomes reveal deep roots of modern Eurasians", Nature Communications volume 6, Article number: 8912 (2015), doi:10.1038/ncomms9912]. ^ a b Fu, Qiaomei; Posth, Cosimo (May 2, 2016). "The genetic history of Ice Age Europe". Nature. 534 (7606): 200–05. Bibcode:2016Natur.534..200F. doi:10.1038/nature17993. PMC 4943878. PMID 27135931. ^ Rice, Stanly A. (2007). Encyclopedia of Evolution (1st ed.). Checkmark Books. pp. 102–03. ISBN 978-0-8160-7121-0. Retrieved 11 December 2014. ^ "Bones From French Cave Show Neanderthals, Cro-Magnon Hunted Same Prey". ScienceDaily. University Of Washington. 23 September 2003. Retrieved 29 March 2010. ^ Pidoplichko, I.H. (1998). Upper Palaeolithic dwellings of mammoth bones in the Ukraine: Kiev-Kirillovskii, Gontsy, Dobranichevka, Mezin and Mezhirich. Oxford: J. and E. Hedges. ISBN 978-0-86054-949-9. ^ A. Seguin-Orlando et al., "Genomic structure in Europeans dating back at least 36,200 years", Science, 6 November 2014, doi:10.1126/science.aaa0114. ^ Rougier H, Milota S, Rodrigo R, et al. (January 2007). "Peştera cu Oase 2 and the cranial morphology of early modern Europeans". Proc. Natl. Acad. Sci. U.S.A. 104 (4): 1165–70. Bibcode:2007PNAS..104.1165R. doi:10.1073/pnas.0610538104. PMC 1783092. PMID 17227863. ^ Higham, Tom; Compton, Tim; Stringer, Chris; Jacobi, Roger; Shapiro, Beth; Trinkaus, Eric; Chandler, Barry; Gröning, Flora; Collins, Chris; Hillson, Simon; O’Higgins, Paul; FitzGerald, Charles; Fagan, Michael (24 Nov 2011). "The earliest evidence for anatomically modern humans in northwestern Europe". Nature. 479 (7374): 521–24. Bibcode:2011Natur.479..521H. doi:10.1038/nature10484. PMID 22048314. Lay summary – BBC News (2011-11-02). ^ a b c d e f Higham, T.; Ramsey, C.B. ; Karavanic, I.; Smith, F.H. ; Trinkaus, E. (5 January 2006). "Revised direct radiocarbon dating of the Vindija G1 Upper Paleolithic Neandertals". Proceedings of the National Academy of Sciences. 103 (3): 553–57. Bibcode:2006PNAS..103..553H. doi:10.1073/pnas.0510005103. PMC 1334669. PMID 16407102. ^ Anikovich, Mv; Sinitsyn, Aa; Hoffecker, Jf; Holliday, Vt; Popov, Vv; Lisitsyn, Sn; Forman, Sl; Levkovskaya, Gm; Pospelova, Ga; Kuz'Mina, Ie; Burova, Nd; Goldberg, P; Macphail, Ri; Giaccio, B; Praslov, Nd (January 2007). "Early Upper Paleolithic in Eastern Europe and implications for the dispersal of modern humans" (PDF). Science. 315 (5809): 223–26. Bibcode:2007Sci...315..223A. doi:10.1126/science.1133376. PMID 17218523. Archived from the original (PDF) on 2016-03-03. ^ Richards, M.P. ; Trinkaus, E. (2009). "Out of Africa: Modern Human Origins Special Feature: Isotopic evidence for the diets of European Neanderthals and early modern humans". Proceedings of the National Academy of Sciences. 106 (38): 16034–39. Bibcode:2009PNAS..10616034R. doi:10.1073/pnas.0903821106. PMC 2752538. PMID 19706482. ^ Aldhouse, S. (October 2001). "Great Sites: Paviland Cave". British Archaeology (61). ^ Verna, Christine; Dujardin, Véronique; Trinkaus, Erik (May 2012). "The Early Aurignacian human remains from La Quina-Aval (France)". Journal of Human Evolution. 62 (5): 605–17. doi:10.1016/j.jhevol.2012.02.001. PMID 22459765. ^ Wild, Em; Teschler-Nicola, M; Kutschera, W; Steier, P; Trinkaus, E; Wanek, W (May 2005). "Direct dating of Early Upper Palaeolithic human remains from Mladec". Nature. 435 (7040): 332–35. Bibcode:2005Natur.435..332W. doi:10.1038/nature03585. PMID 15902255. ^ Harvati, K.; Gunz, P.; Grigorescu, D. (27–28 March 2007). "The partial cranium from Cioclovina, Romania: morphological affinities of an early modern European". Meeting Abstracts. ^ "Evolution: Humans: Origins of Humankind". Pbs.org. Retrieved 2011-10-05. ^ "Prehistoric Sites and Decorated Caves of the Vézère Valley". Retrieved 2014-08-15. ^ A Svoboda J (January 2008). "The upper paleolithic burial area at Predmostí: ritual and taphonomy". J. Hum. Evol. 54 (1): 15–33. doi:10.1016/j.jhevol.2007.05.016. PMID 17931689. ^ Svoboda J.A. (2004). "The Gravettian on the Middle Danube". Paléo–Revue d'Archéologie Préhistorique. 19: 203–20. ^ Viegas, Jennifer (October 7, 2011). "Prehistoric dog found with mammoth bone in mouth". Discovery News. Retrieved October 11, 2011. ^ Bisson, M.S., Tisnerat, N., & Whit, R. (1996): Radiocarbon Dates From the Upper Paleolithic of the Barma Grande. Current Anthropology no 37(1), pp. 156–62. ^ Bisson, M.S. & Bolduc, P. (1994): Previously Undescribed Figurines From the Grimaldi Caves. Current Anthropology no 35(4), pp. 458–68. ^ "Chancelade skeleton". Encylopædia Britannica. Retrieved 18 November 2014. ^ Deniker, Joseph (1900). The Races of Man. London: Walter Scot, Ltd. pp. 313–14. Retrieved 18 November 2014. ^ Lazaridis et al., "Ancient human genomes suggest three ancestral populations for present-day Europeans", Nature, 513(7518), 18 September 2014, 409–13, doi:10.1038/nature13673. Supplemental Information 14; Extended Data Figure 6: "We observe a striking contrast between Europe west of the Caucasus and the Near East in degree of relatedness to WHG. In Europe, there is a much higher degree of allele sharing with Loschbour man than with MA1, which we ascribe to the 60–80% WHG/(WHG+ANE) ratio in most Europeans that we report in SI14. In contrast, the Near East has no appreciable WHG ancestry but some ANE ancestry, especially in the northern Caucasus. (Jewish populations are marked with a square in this figure to assist in interpretation as their ancestry is often anomalous for their geographic regions.)" ^ "beginning with the Villabruna Cluster at least ~14,000 years ago, all European individuals analysed show an affinity to the Near East. This correlates in time to the Bølling-Allerød interstadial, the first significant warming period after the Glacial Maximum. Archaeologically, it correlates with cultural transitions within the Epigravettian in southern Europe and the Magdalenian-to-Azilian transition in western Europe. Thus, the appearance of the Villabruna Cluster may reflect migrations or population shifts within Europe at the end of the Ice Age, an observation that is also consistent with the evidence of mitochondrial DNA turnover" (Fu et al. 2016:5). ^ Lipson et al., "Parallel palaeogenomic transects reveal complex genetic history of early European farmers", 'Nature (2017), doi:10.1038/nature24476. ^ Kostenki-14 (Russia): C1b, Goyet Q116-1 (Belgium) C1a. Fu, Qiaomei; et al. (2016). "The genetic history of Ice Age Europe". Nature. doi:10.1038/nature17993. ^ Haplogroup N was found in two Gravettian-era fossils, Paglicci 52 Paglicci 12, see Caramelli et al. (2003). ^ E.R. Jones et al., "Upper Palaeolithic genomes reveal deep roots of modern Eurasians", Nature Communications volume 6, Article number: 8912 (2015), doi:10.1038/ncomms9912.